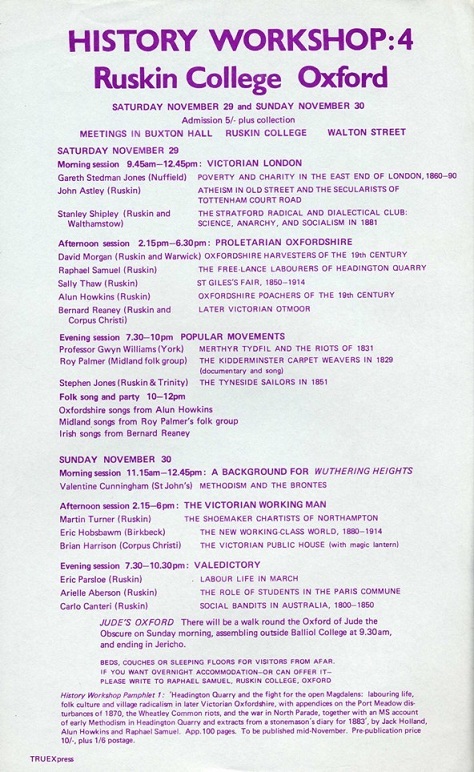 History Workshop 4 took place at Ruskin College on Saturday 29 and Sunday 30 November 1969. It included a walking tour of ‘Jude’s Oxford’ on the Sunday morning, evoking Thomas Hardy’s Jude the Obscure, whose working-class origins barred him from the university education he craved. A party with folk songs was held on the Saturday night, a similar party having also been a feature of History Workshop 3. Unlike the previous Workshops, the event was not advertised with a specific theme, but was simply divided into six sessions. These included: ‘Victorian London’, ‘Proletarian Oxfordshire’, ‘Popular Movements’, ‘A Background for Wuthering Heights’, ‘The Victorian Working Man’, and a ‘Valedictory’ session led by Ruskin students at the end. Papers included: St Giles’s Fair 1850-1914, The Shoemaker Chartists of Northampton, and The Role of Students in the Paris Commune. This was the first time that the Workshop had included papers on the history of countries outside the British Isles. 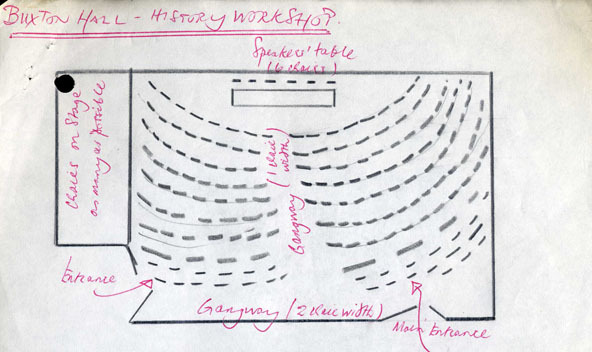 As the Workshop became more established, its subject matter became increasingly cosmopolitan. As had been the case in Workshops 2 and 3, speakers were drawn from students, academics, and other experts, representing universities, adult education colleges, and cultural organisations. 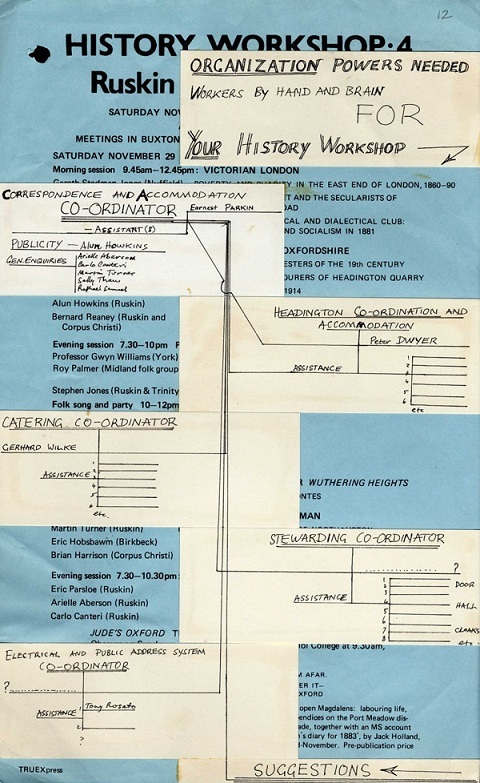 The presentation of papers by worker-students from Ruskin, documenting the study of the trades or areas with which they were best acquainted, was a strong element of the programme. Events at this Workshop had a significant impact on the development of the women’s movement in Britain. At one point in the debate, some Ruskin students commented that they did not think that women should go out to work due to the unpleasant nature of some jobs. When Sheila Rowbotham argued that women should be able to go to work in order to earn an independent wage, and that research should be done into women’s history as a specific area of study, the response was laughter. Following this contemptuous reaction, a group of women met in a student bedroom in order to debate a response. The group, including Sheila Rowbotham, Arielle Aberson, Anna Davin, Barbara Winslow, and Sally Alexander, helped to convene the first Women’s Liberation Conference in Britain, which was held at Ruskin, where Sally Alexander and Arielle Aberson were students, between 27 February and 1 March 1970. In the following years, feminism and women’s history became a core element of the History Workshop ethos. according to Sheila Rowbotham’s autobiography, a trade union woman gave a talk about factory women but it does not appear on the printed programme. Was it a late addition? If so, who gave the paper?